Constant voltage charge (constant voltage and constant resistance charge) is recommended. Charging current is limited, so be sure to charge via a charge-limiting resistor. The specified charge voltage must also be observed. 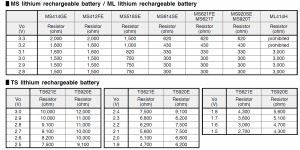 Observe the specified charging voltage range. * Charging at a voltage higher than the upper limit may degrade the electrical characteristics or lead to leakage or bursting. * Charging at a voltage lower than the lower limit significantly reduces discharge capacity. 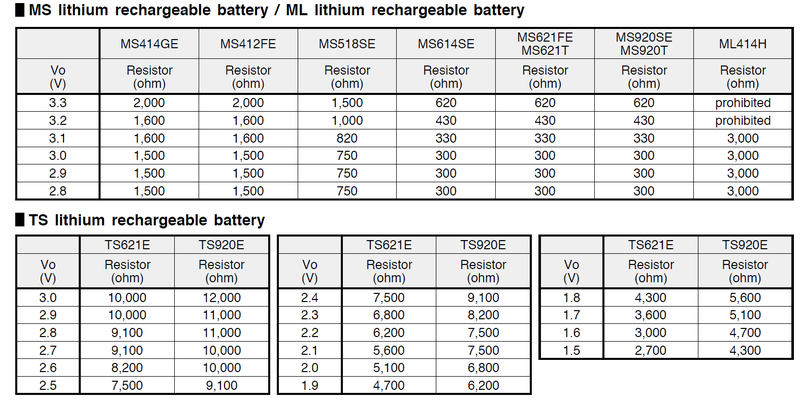 The charging voltage “Vo” must Not be higher than 3.3V (MS series) / 3.1V (ML414H) / 3.0V (TS series). A resistor must be inserted to regulate the charging current, because our rechargeable batteries have a limit for charging current. Please see the below table for recommended resister values. Those values are minimum for each battery type and “Vo” in the charging circuit. should be 620 ohm or more. Discharge capacity depends on charging voltage. Lower charging voltage may cause lower discharge capacity.